If you’re using Google AdWords you need to track how well your campaign is performing. 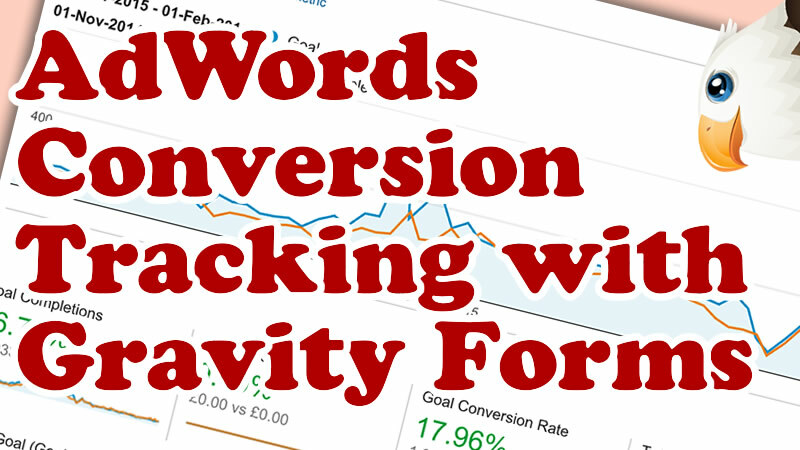 In this video we track entries made through our contact form with the AdWords conversion tracking code. With this data we can then optimise our account based on the keywords and adverts which are actually generating leads. You can get Gravity Forms here. I’ve always found the most accurate way is by redirecting to a thank you page as shown in the video.. If you need help with your Google Analytics goals take a look at this video. Hi there, Thank you so much for this video! I want to do this for Ad Words and for Facebook. Do you see any conflict? I don’t want Ad Words and Facebook both taking credit for the same conversions. I don’t think it will be an issue but I’m not sure! Thanks again! Thanks for watching. The two should play nice together and not take each others conversions as the cookies are different. Can you provide a solution that works, that you’ve tested? I have tested it and it works fine. Could you give me somemore details? Hello, found you on search. Today in 2017 would you still suggest this Creative Clans Embed Script plugin as it has no update since 2015 apparently? or would simple-embed-code by David Artiss be workable? it’s amazing that gravity forms still has no function for this, even at the developer level. Thank you so much for this tutorial, just what I needed! Just wanted to reach out to share that if you use a confirmation message instead of a thank you landing page you are also able to create a shortcode in your themes function file and then put the shortcode in the gravity forms confirmation message. This way makes it so you don’t have to install the other plugin to add code to a page. You could also use this shortcode on the thank you page instead of in the confirmation message. So you would add and customize the following code to your theme’s functions.php file. If there are any ” inside the code you would need to make sure to escape them with a \” but in my example there are none. Great video mate, would be good to see a Gravity guide using AJAX onclick event for submission if you ever get time!